Welcome to Thailand! Arrive in exotic Bangkok, Thailand's capital city. The rest of the day is at leisure to rest, relax and acclimate to the new time zone. Land only price does not include arrival/departure transfers, but does include intra-flights Bangkok-Yangon and Mandalay-Bangkok. Cruise itineraries are subject to change. Alternative sights may be visited depending upon water levels. The Irrawaddy Explorer cabins cannot accommodate 3 passengers; therefore, triple rooms will be accommodated in a twin and single cabin. This moderately active trip covers a fair amount of ground each day. Expect from three to four hours walking every touring day. The pace is moderate, however you will encounter some uneven surfaces, stairs, steps and significant slopes. Low water levels may require walking additional steps or slopes to reach the bank. The Irrawaddy cruise will start in Prome. 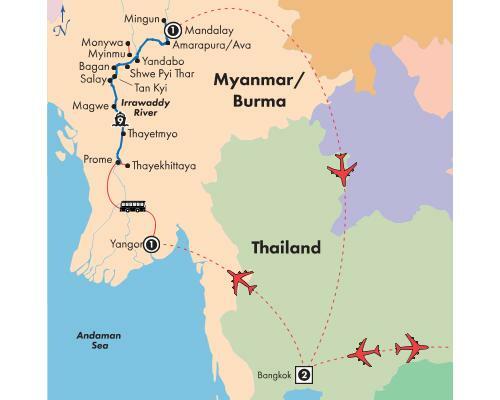 Transfer from Yangon to Prome requires 5 to 7 hours driving.